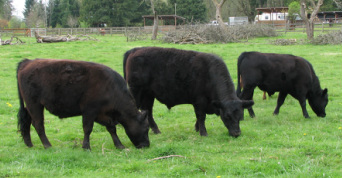 Breeding and Raising Irish Dexter cattle both polled and horned with superior genetics and temperament. RdoubleD Acres is located in Monroe Washington, we are about 45 minutes North East of Seattle. It is our goal to breed a true dual purpose Dexter. One that has good udder attachment, excellent feet and correct leg structure and provide high quality beef and carcass yields. We attend several shows a year, by doing this we hear the judges comments about our cattle and learn where improvement needs to made. We use this information along with data collected from other sources to insure that our breeding program is constantly improving. This is how Champions are made! Because of our dedication to breeding quality and following through with the desire to improve we have won several Grand Championships and at the Evergreen State Fair Premier Exhibitor 8 times and counting. Irish Dexter cattle are not miniature. They are the smallest British breed of cattle. They came to the United States in the 1900's from England and Ireland. In Ireland they were often used a house cow because of the small size, their ability to produce milk for the family and still raise a calf for beef. They also were used as oxen, making them triple purpose cattle. Looking to raise family friendly cattle. Dexters are perfect for the family. Because of the smaller size, they are less intimidating so the whole family can participate in the care of them. Because they are smaller in size, they consume less feed, require less acreage, and are less damaging to the pastures then the standard breeds. The Dexter cattle have excellent feed efficiently, consuming about 1/3 less feed then you standard cattle. When provided with good pasture and hay when grass is not growing they will finish out naturally at around 18-24 months of age. Because Dexters are considered dual purpose they make excellent family milk cows while producing high quality beef calf to raise. The Milk production of a Dexter is less then your traditional milk cows so milk related issues are kept at a minimum. Families who milk their Dexter often share milk with a calf. To do this, you milk what you need from the cow, making sure to leave enough for the calf to grow and develop on. DEXTERS are known for their ease of calving and are very good mothers. Breeding longevity with many Dexter cows calving at 14 to 18 years of age. Heifers are usually bred at 14 to 16 months of age so they are at least two years old when calving for the first time. A Dexter bull may be used for breeding other standard sized breeds to decrease calf size, reducing in calving issues, increasing profit margin and producing quality crossbreds. The crossbreds seem to grow fast, mature early, have excellent food efficiency and improved carcass yields. 2014 All rights reserved. Site created by RdoubleD Acres. No content can be used without written consent.